As part of an occasional series, I headed out on a bike & hike outing to Black Mtn in the Santa Cruz Mtns. It's not a particularly interesting peak, coming in as the 12th highest and 11th most prominent peak in the range, but it seems to be exceedingly popular. I had been to the summit on several occasions more than 20yrs ago, before I started writing TRs about my wanderings. Someone had recently emailed me, surprised that I had left this off my list of local summits. It brought it to the fore of my attention and with the need for a bit of exercise, I decided to use my bike to pay it another visit after all these years. The peak is located at the boundary between the Monte Bello and Rancho San Antonio Open Space Preserves and there are four ways to reach the summit from very different starting points. 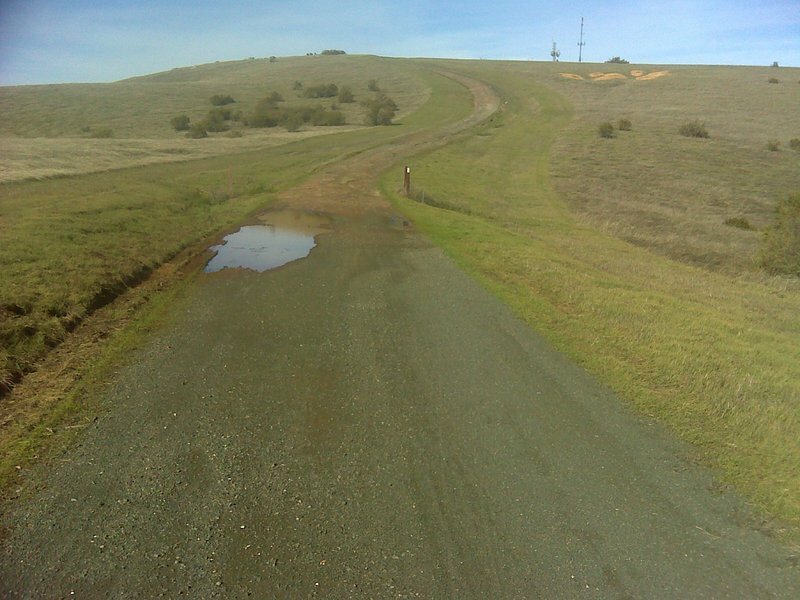 Today's outing would approach from the east via paved Monte Bello Rd, a steep, 3mi climb of nearly 2,000ft. From the end of the pavement it's another 1.5mi on foot (or mountain bike) to the top of Black Mtn, a more modest gradient than the ride up Monte Bello Rd. The route I took on bike was not the shortest nor easiest from my house, but it is rather scenic, follow the Los Gatos Creek Trail from San Jose to Los Gatos, then Highway 9 through Saratoga to the Mountain Winery. A few short climbs takes one over the entrance to the winery and up Mt. Eden Rd to Stevens Creek Reservoir. The trails and roads were damp or wet in places from recent rains, though mostly blue sky today. The grasses have become a deep green and growing tall in what has been a good start to the rainy season in California. Water in the creeks are brown with soil erosion from the recent rains and the hills appear to be reaching the saturation point. A party of half a dozen hikers were just leaving the summit to the west when I arrived from the east around 1p. The views from the top are so-so. The best views are to the south overlooking the Santa Cruz Mtns. Views to the South Bay looking north and east are mostly blocked by towers and trees. A benchmark can be found atop a small pillar just west of the summit towers. My return route went back down Monte Bello Rd, then continued north around the Stevens Creek Reservoir to Homestead Rd in Sunnyvale before turning east and back home in San Jose. It was nice to get out after all the rain and wet conditions we've had this past week.